ADAMTS12 is an evolutionarily conserved chondroitin sulfate/dermatan sulfate proteoglycan. (A) Schematic of ADAMTS12 domain structure. TSR, thrombospondin type 1 repeat; CS, chondroitin sulfate. (B) Alignment of human and mouse ADAMTS12 mucin modules showing a high degree of conservation (asterisks show identical residues, residue numbers are shown on the right), potential N-glycosylation sites (bold) and Ser-Gly dipeptide motifs (red) with acidic neighbors, constituting putative glycosaminoglycan attachment sites. (C) Sequence of the corresponding module from the Ciona intestinalis ortholog of ADAMTS7 and ADAMTS12. Sequence motifs for N-glycosylation (bold) and Ser-Gly/Gly-Ser dipeptides (red) are shown. (D) Representative Western blot (anti-FLAG) of conditioned medium from transiently transfected HEK293F cells shows increased ADAMTS12 band intensity (arrows) following digestion with chondroitinase ABC (C’ABC), but not heparanase or keratanase I & II. The blot is representative of n = 3. 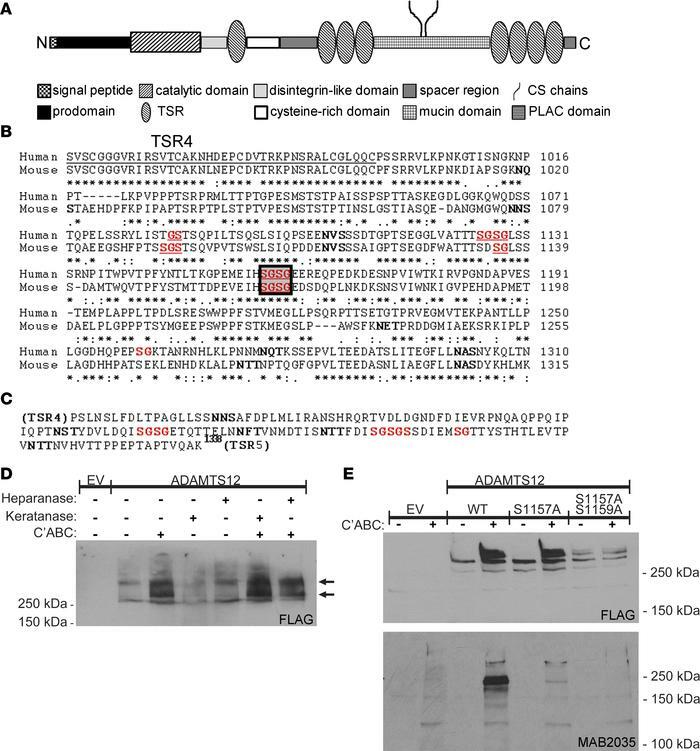 (E) Mutation of Ser1157 and Ser1159 (boxed residues in panel B), but not Ser1157 alone eliminates enhanced signal after C’ABC digestion and reactivity to an anti–chondroitin sulfate stub antibody (MAB2035) strongly suggestive of chondroitin/dermatan sulfate attachment at Ser1157 and Ser1159. EV, empty vector; WT, wild type.